November 25, 2008 | NORTH LOGAN -- Get out your box of decorations. The Lights of Christmas home decorating contest has begun. Brenda Anthony, who is in charge of organizing the contest, helped start it 19 years ago. "We drove to Preston (Idaho) many years ago and saw what their community did with decorating," she said. The contest began and North Logan was the first area within the valley to start this tradition. Upwards of 100 residents participate in the contest every year. According to Anthony, decoration has gotten more professional each year. "Last year someone had their lights set up so that when residents drove to their house, Christmas music would play," she said. A house doesn't have to be decorated too fancy in order to win the contest. "Some places have people come decorate for them, but that's not the important thing. A wreath that's nicely decorated could give someone as much of an edge as anyone else," Anthony added. Anthony is responsible for finding the judges every year. She likes to find at least three locals. This year there will be about eight judges. Winners are decided based upon the judges' taste. "I think we do it pretty fair, there's a varied group of people judging," she said. 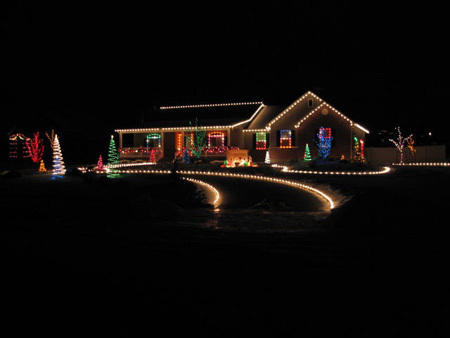 Bruce Howe, the 1st place winner in last years contest takes much pride in decorating his house. He doesn't mind simple, traditional things, but he doesn't like it when people get too carried away. "It;s not how many (lights) you put up, its how you put them up," he said. Howe tries to emulate the Christmas lights he sees at places such as Temple Square and Disneyland. Last year, he outlined his sidewalks and driveway with lights. Another style he likes to use is decorating each outside window with lights of one solid color. He doesn't like to use multi-color lights because they aren't as eye-catching . Don't expect to see Howe in the winner's circle this year. Contest rules state that someone can't win two years in a row. Howe wants to see this rule changed. He would love to see what the winner from two years ago did to make his home win, and thinks it would make for a good competition. However, winning isn't the most important thing to Howe. "I love to do this, contest or no contest," he said. To enter the contest, pick up an entry form at the city office, or print one off at home from the city's website. Judging begins Dec. 1. and ends the 15th. Winners will be announced at the Dec. 17 city council meeting, and prizes will be awarded. Local businesses such as Lewiston State Bank, Bennetts Paint and Peterson Allred Jackson, P.C. sponsor the lighting contest. The 1st place winner receives $100, 2nd place receives $75 and 3rd place receives $50. Six honorable mentions are rewarded with pie from Village Inn. Anthony urges residents to see the lights. "It's fun. Bundle up, get your thermos of hot chocolate and drive around and enjoy the community."